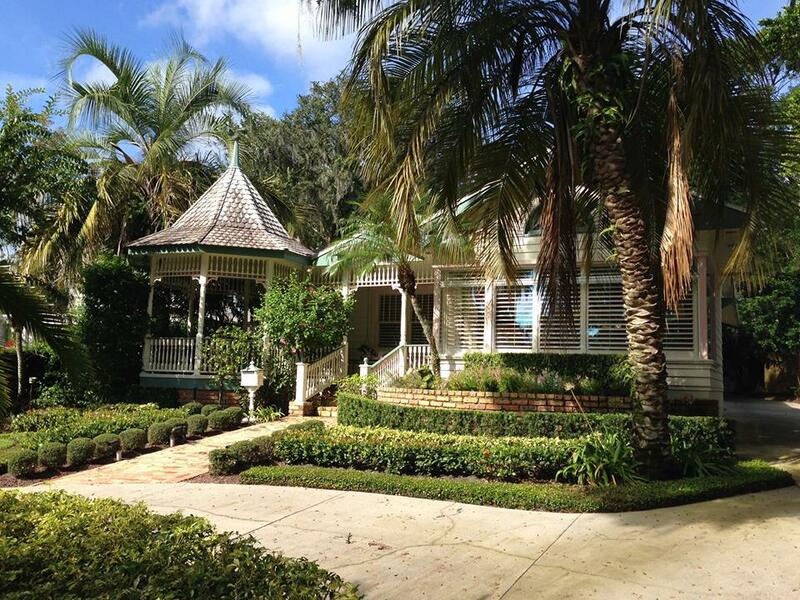 In recent months, as a revised historic preservation ordinance makes its way toward the Winter Park City Commission, there’s been a lot of buzz about historic districts, and whether they constitute an all-out assault on property rights. Common charges against districts include that they’re overly restrictive; that you must consult a governing authority before making even minor changes to your home; that they decrease property values; and that homes in historic districts rot in disrepair while new development buoys surrounding neighborhoods. Jim and Elizabeth Faiella live in a charming 1925 Victorian-style cottage on Lakeview Drive in the College Quarter, right across the street from Lake Virginia. Elizabeth, an attorney, bought the house in 1988, about 15 years before the neighborhood was designated a historic district. She raised two sons in the 3/3 house which, at less than 2000 square feet, seems surprisingly spacious. 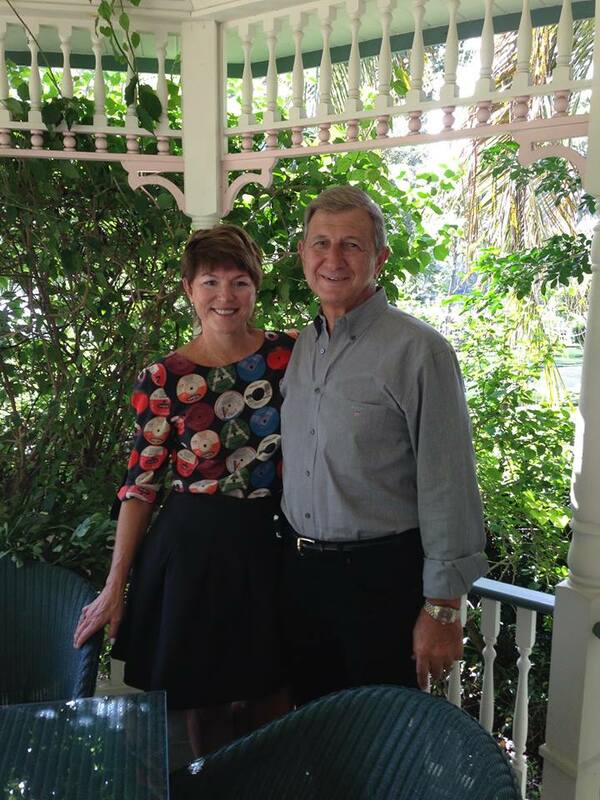 She and Jim, a retired construction estimator, married in 1992. They savor time spent with their large blended family, whom they entertain in their cozy home many Sunday afternoons. “There’s no getting away from one another, and we love it,” he smiles. 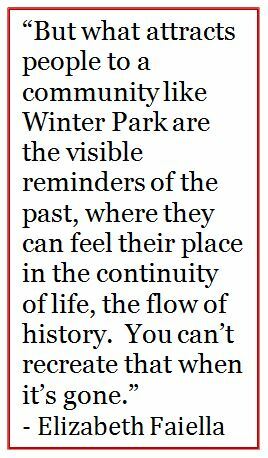 Preservation Winter Park: What do you like most about Winter Park? What do you think makes it so special? Jim: I think the older homes, the tree canopy, and you feel safe here. Growing up in the era that I did, everybody sat on their front porch; people walked by and chatted. And it’s the same thing here—people walk by, and you know everybody, and if you don’t, you introduce yourself. It’s a living neighborhood, as opposed to other places, where there are all these big, huge homes but there’s nobody around. Those neighborhoods look vacant to me—like a façade or a movie set almost. I just love this area. I hope that the City will preserve the older homes and not let people come in, buy an old house, tear it down, and then build something so out of character that it damages the neighborhood. I think when people come from out of town, and they walk down Park Avenue, visit the park and drive through the neighborhoods, they see houses like the old houses on this street and they fall in love with it. I don’t think they fall in love with the big shoebox homes. Elizabeth: I was thinking about this yesterday, when I went to get a dress hemmed at Yuki’s, and had my nails done next door, and I walked there. And I thought about Rome, which has a rule—their rule is you can’t build any building taller than the Vatican. And what’s happened is that this has helped make Rome one of the most beautiful cities in the world. They had a rule, and they’ve stuck to it. Paris had an amazing planner under Napoleon, Baron Haussman. They have these wide boulevards, and keep building heights low, and it’s still one of the most beautiful cities in the world, because they’ve stuck with the plan. And in Winter Park, we have this, in a way, and we cannot screw this up. When this gets encroached on, it makes us nervous, because you’re giving up that village feel. I have a quality of life that is amazing. I literally live like a European, where I can walk to my office, walk to the farmer’s market, wherever I want to go with the exception of grocery shopping. All this, and I’m right across the street from the lake, where I watch the sunrise every morning, see an otter on the lawn, and an owl in my backyard. It is a real privilege to be able to live like this. PWP: What do you say to people who say, I should be able to build whatever I want to on my property? PWP: Do you have any sense of what’s happened to property values in this neighborhood, as a designated historic district? Elizabeth: Yes, I have a good indicator. Through my life, there are times when I need to take out a home equity loan. It depends on how my business is going. Some years are good, and some are not so good. So they reappraise your house when you have a home equity loan. This house has steadily increased in value over 25 years. And around me, I darn well know what it’s done. The house next to me has sold about every five years. And I’ve watched the value increase by leaps and bounds each time. The house on the other side of me just sold for a million—when I first moved here it was $195,000. Neither one of them has been touched much. PWP: You have an amazing (lakefront) lot here, and you’re just around the corner from Park Avenue. Aren’t you afraid that someday, when you might need some money, that a former Backstreet Boy or Orlando Magic Player might come along and say “I need this lot for my dream house. I’ll pay you double the market value.” And you’ll have to explain to him that it will be difficult if not impossible to get permission to knock it down because it’s in a historic district? Elizabeth: I’m not afraid of that. That is not my thinking. The idea that it would be difficult to do that is reassuring for me. The people that come after us, if we don’t protect it, will have no concept of where we came from. And this matters. We have a home in Italy in the little village where Jim’s grandparents came from. It was a fixer-upper of major proportions. A tree was growing in the middle of it—we’re talking, bats living inside, practically ruins. We reconstructed it from the inside out. We could not add a window or door or anything on the exterior because the historic preservation law. Jim: All the homes in that area are the way it was 900 years ago. Prior to that there were wars, et cetera, but all of the architecture appears as it did 900 years ago. PWP: Was that a major pain in the neck? Did you resent that intrusion? Jim: It was exciting and it was wonderful. The reason we bought a home that was 900 years old was because you could live in a place where 35 earlier generations had lived. Elizabeth: Well, where do you start? When do you start preserving history? We’re a younger civilized country. The idea that we wouldn’t start because we got started late? That makes no sense. It’s never too late to do the right thing. PWP: I know you owned a house over on Antonette that you needed to make some structural changes to. How was going before the Historic Preservation Board? Was it difficult? Did they give you a hard time? Jim: No. The bottom line was, they said, “don’t change the exterior from the street.” The back we could do some things, and structurally we did some things under the house. We added a few walls, and added on in the back, to make the house more livable. But we didn’t change the façade or the look of it at all. Elizabeth: Look. Living in a historic district is not for everybody. If you don’t like the feeling of it, playing by the rules, there are ample places you can live, where you can isolate yourself and do what you like on your property. But if you want this, the places you can live in Central Florida are very few. Why would we want to allow that to be changed? The property values in Winter Park are maintained because of this, not in spite of it. If you’re not swayed by preserving the soul of the place, the comfort, the quality of life, then at least pay attention to the economics. Lots of times in our society, a law might crimp the style of an individual, but for the greater good, we make rules. Historic preservation is done for the greater good.